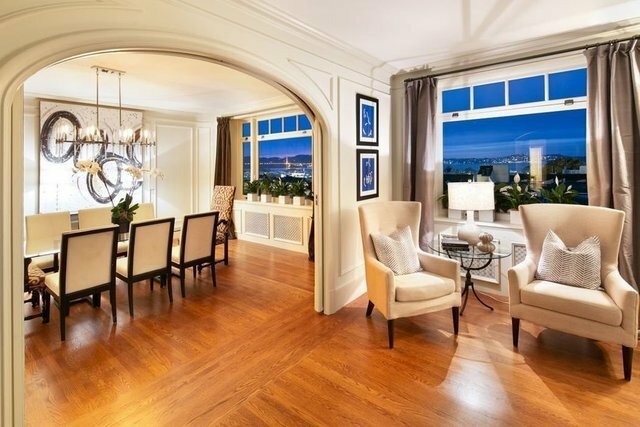 Statuesque, iconic Art Deco building on a flat block of Vallejo Street in the heart of Pacific Heights. Sensational views from Golden Gate Bridge to Alcatraz. Elevator access to full floor apartment, 2 car parking, 2 storage units, 3 bedrooms, each with en-suite bathrooms; powder room, additional 4th bedroom/office; formal dining room, grand scale living room; smartly modernized kitchen. Architectural period detailed arched doorways and niches, glass pocket doors, picture and crown molding. Smartly upgraded kitchen, powder room and luxurious master bathroom. High quality stainless appliances including a Sub Zero refrigerator, stainless gas range, double wall ovens, wine refrigerator and hexagonal stove hood. Custom cherry cabinetry provides ample utilitarian and decorative storage. Breakfast nook overlooking the bay and the breakfast bar surrounded by lounge seating accommodates casual dining. Prospective Buyers to be approved by the Cooperative Board.